Flattering50: Happy Hosiery: Great Quality, Great Price! Happy Hosiery: Great Quality, Great Price! In September, I wrote a post about NY Times fashion reporter Cathy Horyn's five things for fall list. 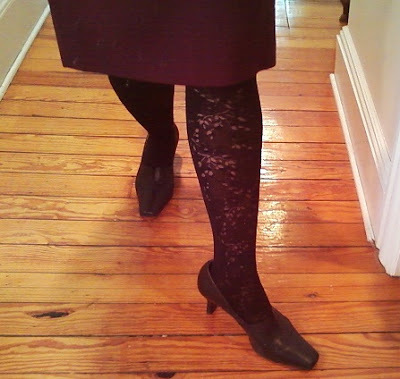 In the post, I gave my own fall wish list, which included textured stockings. Well, apparently, I’m not the only one in the market for special tights these days. Women’s Wear Daily recently reported that as of August, retail sales for sheer hosiery, tights and socks had reached $3.19 billion for 2011. Wow—that’s a lot of hosiery! “The tough economy,” reports Karyn Monget in Spring Forecast: Sheer, Bold, Colorful article (WWD, Oct. 24, 2011), is “expected to help drive continued growth next spring, as consumers seek inexpensive ways to dress up an out.” I hadn’t thought about textured stockings as a budget-minded fashion strategy, but it’s a good point. For me, I was simply looking for a way to add a little life to an outfit. If you've looked online for textured stockings, you've probably noticed that they can be quite pricey. Frankly, hosiery isn't something I wish to spend a lot for. Recently, a work colleague told me to check out Vera Wang’s Simply Vera collection at Kohl’s. I did and I’m writing to say that I love the pair I bought and plan to buy more! The fit and quality is perfect! And you can’t beat the current sale price (regularly $14, now $8.40). To shop, visit Kohl’s sock and hosiery link. You'll find a wide, wide selection of Simply Vera and Apt. 9. Cyber Weekend: Are You Ready for Shopping?